I had reached the point where I could not roll over in bed without waking up in pain, could not get into or out of a car without excruciating pain, and was unable to walk or stand for more than 3-5 minutes at a time. I wasn't able to dance, to hike or do any of the activities that made my life fun to live. It looked like I had no choice but to go under the knife, something I had been putting off because there was no guarantee it would work. By chance I discovered APOS Therapy. Within 2 weeks of beginning their programme, I was sleeping painlessly, geting in and out of the car much more easily, and walking for about 10 minutes before needing to rest my legs. Let me share with you, both about my experience, and what I learned about this approach to healing from knee osteoarthritis. Why Does the Pain Get Worse Over Time? It seems that once we have had some kind of injury to our knees, the muscles contract around the affected area in an attempt to reduce the stress on the joint. Unfortunately, this has the opposite effect and it means that our leg muscles are no longer acting in a balanced fashion, with the particular muscle groups no longer doing what they were meant to do. For me, the injury was the result of a skiing accident when I was 12 years old. I spent a few weeks in the hospital, hooked up to weight traction equipment to straighten out my knees. I received no other treatment and remained active in sports (some very demanding sports, in fact) and only toward the age of 40 did my knees start acting up. By the time I was 50 I was beginning to feel the impact on my activities and I had to stop dancing and hiking. I finally saw a doctor several years ago when my knees flared up and I couldn't move without intense pain. 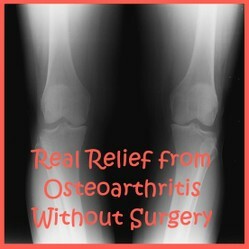 He relieved my pain with an injection of cortisone into the joints and told me to hold off on knee replacement surgery as long as I could since there are continuous improvements and, in any case, the replacement knees are often only good for up to 15 years. The earlier you start taking care of your arthritic joints, the longer you will put off pain and disability. I was no longer dancing. I could no longer walk for long leisurely walks. I could not stand still for very long. But I made adjustments and kept on going. Finally, within two months, I suffered an incredible downward spin - I limped on flat surfaces and walked at an "old lady pace". I went up and down stairs like a toddler, hanging onto the rail for dear life. But when I could no longer sleep without pain, could no longer get into or out of my car without almost breaking down in sobs, it was time to bite the bullet and look for a surgeon. I redid my x-rays that only confirmed that my knees are in terrible shape. You can see in the x-ray above that the inside of the knees are not cushioned as they should be, and that my legs have a slight "bow" shape to them. I never realized that that was due to the knee injury. I went all through school having kids remark about my bowed legs. So I waited and waited, finally saw an orthopaedic surgeon who told me I was a ripe candidate for knee replacement. I read about the pros and cons of knee surgery --- and was scared. I know that some people come out of it with a new lease on life. And I knew that for some people, even after the operation, suffer unabated pain; for a small number, their situation is even worse post-op, with reinfections and a dismal prognosis. The problem with knee replacement surgery is that once they take your knees out there is no way back. Even in the best case scenario, recovery is slow. I am now a grandmother with responsibility to help with my new grandchild and I don't want to take the time off to lounge around waiting to recover from surgery. So I procrastinated yet more. Facebook Comes to the Rescue!! Surprise! A random ad on my facebook page kept popping up. I don't know what cues facebook used to think I would be interested; perhaps my friend who had just had knee replacement surgery and wrote me about it on facebook. In any case, I saw this weird ad for APOS therapy for knee and back pain. Being the procrastinator that I am, it took several weeks before I finally opened the ad and started to read. I liked what I read, so I called my orthopaedic surgeon and asked for a referral. For some reason, he did not seem to want to refer me, but he had to, so I received the referral form by fax within a few minutes. Three days later, I was at my free evaluation session at the APOS clinic in Haifa, where I live. APOS stands for: All Phases of the Step. It was established in 2004 by 2 Israeli orthopaedic and sports medicine experts. I guess it is based upon the fact that when you have arthritis you are not stepping properly. APOS Therapy gets you back to using all parts of your foot properly. I took this photo of my own shoe. The therapy is simple, it involves getting specially designed shoes that accept rounded "pods" on the soles. There are three grades of pods, from relatively flat to much more rounded. The pods are adjusted according to the way you are currently walking, in order to get your muscles back into balanced functioning. As the therapy progresses, you are given the rounder pods that increase the intensity of the muscle training your legs get. You do two things: first you walk back and forth a few times on a computer-monitored strip of floor about 6 meters long barefoot and in shorts (so the examiner can see your lower legs as you pace); then you sit at a computer to fill in a questionnaire about your quality of life. The questionnaire, I am sure, is part of their on-going research on the effectiveness of their treatment. There was one problem I had with the questionnaire - many questions asked about the effect of "my health", rather than the effect of the pain in my knees. At first, I answered that my health didn't cause me problems because, other than my knees I feel great. But when I realized that they meant the one particular problem I came with, I had to go back and change many of my answers. Does anyone else regard their arthritis as something separate from their general health, or is it just me? After I completed the questionnaire, I had a short exam with the physiotherapist, who checked the degree of flexibility and pain in my knees. She told me that my pace-test showed that I have the typical "arthritis walk", meaning that I stop on both feet before lifting the next foot to continue forward. It was surprising to me because even after she told me that, it was not something I could feel happening. After that, if you are deemed suitable for this treatment, you are fitted with the shoes and given instructions on how to proceed at home. The first week I was to wear the shoes for 30 minutes in the house, doing simple chores such as washing the dishes, dusting, and such. However, I was only supposed to be on my feet for 10 minutes - whether that was 10 minutes straight or a total of 10 minutes during the 30-minute period. The second week the time was increased to wearing the shoes for 40 minutes, 15 of which I was to stand or move, then for the third week I wore the shoes for 50 minutes, standing or moving for 20 minutes in total, and the fourth week, I was told to stand or move for 25 minutes of the 60 minutes wearing the shoes. At first writing, I am now just starting the fourth week. I was shocked and thrilled - after only 4 days, I was already beginning to sleep through the night without pain. I know I rolled over during the night because I would end up facing a different side of the bed in the morning than the one I faced when falling asleep. This made a big difference to how I functioned during the day. I should mention that after the first few days, I felt my thigh muscles gently aching, as if I had just got off a horse after having not ridden for years. I assumed that was just a sign that some inactive muscles were being worked out. Good! Within a week I was able to get into the car with only a little pain, but it was only in the third week that getting out of the car began to be a bit easier. I noticed that I was walking faster and more happily. I could go to the grocery store and only need to sit and rest once on the way back. Furthermore, I was down to 1 or 2 pain pills a day (600 mg each) as opposed to taking up to 6 pills on some particularly bad days. This week, after the third week of the treatment, I haven't taken any pain killers. My life was beginning to change. The cold rains of winter are very stressful for those who suffer from arthritis. I am looking forward to seeing how much easier I will fare this year than the past few years. See how optimistic I am? I took this photo of my own shoes. UPDATE: middle of my 6th week and after heavy rainstorms and cold weather. I still sleep painlessly through the night. I can get into and out of the car easily, but one knee or the other might suddenly twinge in pain while walking on flat ground. I still wear my knee supports when I go out of the house because otherwise it will hurt after a short time of walking. UPDATE 4 FEB 2014: Today I looked after my granddaughter and I was so happy to find myself able to crawl on my knees alongside her. I was doubtful I would even be able to sit down on the floor and get up again and here I was gliding along on my knees, moving easily from sitting on the floor to standing. Today was a particularly good day - it is possible I will have more pain tomorrow, but I don't mind that. Here in Israel, where the shoes were developed, our national health insurance covers 75% of the cost. We pay about $1000 for the first year and that includes the shoes and pods, and 7 visits over the year. Given how great I am already feeling, I would pay ten times that much, but don't let APOS know that! APOS Therapy has just come to the USA and is so far available only in Manhattan. It is also available in Singapore. The websites do not give an indication of costs or insurance coverage. Here is How APOS Explains It . . .
Several scientific articles have been published with details of the treatment and its effectiveness. There are still rather small sample sizes and there are no studies that extend beyond 2 years. I would also like to know how much regression can be anticipated if someone stops wearing the shoes after 1 or 2 years. You Will Still Want a Knee Support Sleeve! If I'm going away from home for several hours, I still wear these because my knees still hurt after a short time of walking. I hope APOS Therapy Will Soon Be Available to Everyone Around the World! I know it Seems Hokey, but I'm Living Proof! WordChazer - hope you check this out and let me know what happens when you do. Glad you visited my article, David. Nice for readers to have a specific address to which they can turn for personalized attention. My name is David, I am an employee at AposTherapy. I just wanted to start by thanking Sheri for sharing he wonderful experience. We really enjoy hearing from our patients about their progress, it is always exciting to see them happier and without pain. If any of you have questions about AposTherapy and how it can help you or your loved one please do not hesitate to email me at davids@apostherapy.com. AposTherapy is currently available in the US, UK, Israel and Singapore. You can learn more about how it work on our website www.apostherapy.com (co.uk, .com.sg or .co.il for our other locations). Please feel free to contact me, or us via the website with any questions you have. Happy Holiday and a healthy and happy New Year to all of you. So far it is only in Israel, the UK and New York. If you are not in one of these places, Prashant Pujara, perhaps you could show this article to your doctor and he or she can find out more about it. Thanks Katie. Nice to hear from you. Great to hear you found a non invasive option to pain relief. I've heard arthritis can be very painful. Great article congrats on the award, much deserved. Tolovaj - some people's knees do last forever. Hoping you are one of those people. Don’t let arthritis stop you or your family from traveling. In fact, it is possible that travel will be good for you.